Welcome to The Club Level - as a guest, you deserve the very finest for your vacation. The Club Level offers just that - now featuring our Hotel Collection Linens. You will be welcomed at bedtime with a down alternative comforter enveloped in crisp white sheets giving you the same look and feel of a luxury hotel (but with the comforts of home) along with upgraded toiletries. The Club Level also provides free unlimited movies through Netflix (for most units). No Check In required for The Club Level - go directly to your unit and start enjoying your vacation as soon as you arrive! CARIBE THE RESORT...by far the most exclusive condominium address Orange Beach has to offer: Caribe's contemporary architectural design features 3 buildings each 14-stories with dramatic 14-story skylit atriums, include lush natural landscaping and water features. The 23 acre Resort borders more than 1-1/2 miles of unconstructed shoreline, pristine beaches, protected natural habitat, and breathtaking sunsets. Caribe is truly one-of-a-kind; come enjoy all this resort has to offer from one of the best locations in the buildings. This 2/2 unit features over 1650 sq. ft. of casual elegance. With its warm inviting colors and comfortable West Indies style furnishings, you’ll feel like you are on your own tropical island! The Master Bedroom Suite is spacious with a king bed and unbelievable views. The huge bathroom is superbly designed with Jacuzzi brand tub and separate full body massage shower. Need to catch up on emails? There’s even a desk with internet access available for your convenience. Love to cook? This unit features a gourmet kitchen, including stainless steel appliances and granite countertops set in European style cabinetry – complete with all the dishes and serve ware you will need. There is a separate wet bar area complete with ice-maker and wine cooler. This unit has 20-inch porcelain tile flooring in the living area and carpets in the bedroom, 9 foot ceilings and tinted, floor to ceiling full-view windows and glass doors for the oversized, curvilinear balconies. This exclusive oasis includes two and three-tiered outdoor swimming pools, 6 hot tubs, large indoor pools with 3 Jacuzzis, saunas, steam rooms, state-of-the-art fitness centers, tennis courts and a 10,000 square foot Tiff Eagle putting green. These are a few of the many features, which makes this the best resort on the island. Close by there are so many things to do if you have gotten enough play and relaxation at the resort. There is shopping galore at Tanger Outlets, you can charter a boat and try your hand at deep sea fishing; go see the dolphins on an afternoon cruise; take a trip to Pensacola and see the Naval Museum & Imax Theatre or if you're lucky enough to be visiting the area at the right time, you might get to see the incredible Blue Angels Show!! Our many restaurants feature local seafood and most have live entertainment as a bonus! Need even more action? Biloxi and its many casinos is just an hour and a half away. You will want to come back to this area time and time again. Come see why Caribe the Resort has been voted #1 for the area!! BEAUTIFUL condo. Loved condo and the decorations and the view from the balcony. I have used VRBO many times....and had good experiences. However, we did NOT have a good experience this time. I sent TWO emails a few days before we arrived (with our family from San Antonio, TX) to make SURE that we would have our room key available to us for the 1pm early arrival (we paid extra dollars for early arrival). We drove a long way and paid a lot of money for this short vacation. When we arrived at the condo a few minutes after 1pm...NO KEY. So...stress right away...plus it was an embarrassment that our family couldn't get into the condo. We sent a message......and then waited and waited for a key...FINALLY.. key was brought to the condo. Secondly, we only stayed 2 nights (meaning we were there for only one FULL day) and had to call guest services because the bathrooms had only 1/2 of a roll of toilet paper EACH. I was not happy with the tone of the response from VRBO about needing more toilet tissue. Their response was "we told you in your information that limited supplies were available and we gave you a list of what to bring". I think paying what we had to pay for two nights...there should be at least one FULL ROLL of toilet paper in each bathroom. Thirdly, the shower in the master bath had not been cleaned...dirt and hair all over the shower floor. And lastly, on the morning of check out time, we tried and tried to use the "Check Out" app and it didn't work. It took 35 minutes to send text, emails....and get answers about checking out...MORE stress.. The threat from VRBO that fines would be added to the bill if we did not check out of the condo using the "guest app" added even more stress. We did everything we were suppose to do and treated the condo with respect and left the condo in immaculate condition. None of these problems were the fault of the owner...just VRBO. Thanks for your feedback. We checked with guest services and the keys were delivered by 1:20 PM. And the guest was contacted during that time. This is not a normal occurrence as keys are always delivered by check in time. What the guest failed to state in their review was that they were not charged for 1PM check in fee. And housekeeping delivered extra toilet paper rolls for both bathrooms. With a 99% guest service satisfaction 5* rating, our support staff resolves guest's issues during their stay, and there was no exception with this guest. Guest services sends notifications by emails and text messages to all of our guests to let them know if they need any assistance or issues resolved during their stay to contact Guest Services through the guest app. 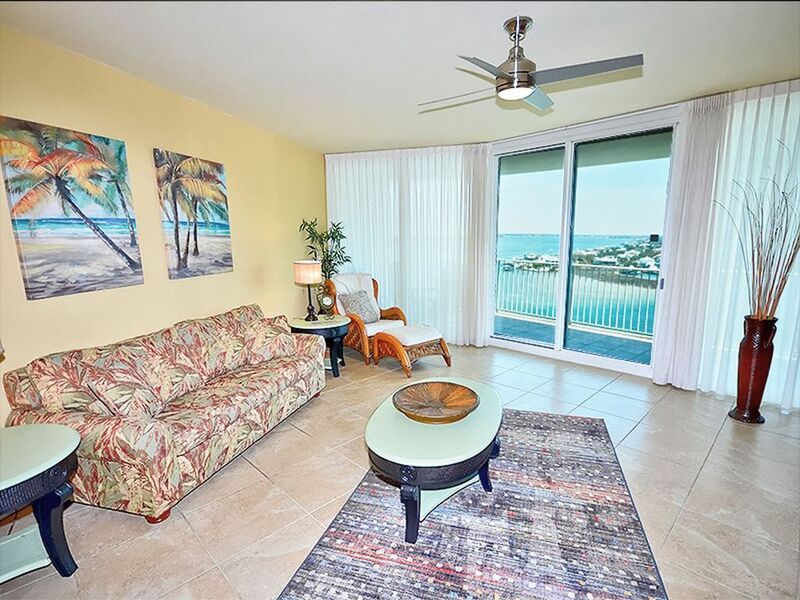 Nicely decorated condo in Building C with views of bay and ocean. The condo was spacious, the beds were super comfortable and the kitchen was well equipped with everything we needed. I had looked at several condos before booking this one and felt that the nightly rates and fees were very reasonable. We had a great experience and will definitely stay here again!! Beautiful condo with great aminities. It is much larger in person. Beautiful place to stay. We loved staying in the condo! It’s very nice and spacious! The Pools all need the tiles fixed and mold under the waterfalls the Lazy River was very hot with the stainless steel in the bottom of it , around the sides where rusted, I was scared my float would bust due to it, or I would get cut due to having to pull ourselves around the lazy since it did not move. Would have love more shade over the river also. I asked several employees for help about how to get to my room, parking, pool areas and only 1 employee could answer my question through out our stay. This was very frustrating! This guest must not understanding this review system. The review system is for the condo that they rented not the complex. We have no control over the complex pools. We will forward this review to the Condo management. NOTE: Guests please use public review systems other than VRBO to review the complex. Lazy River, Putting Greens, Waterslides, Game Room, Boardwalk along the bay, Bocce Ball Courts, Fitness Centers and Full Service Restaurant on-site now open!! Email us for the Best Rates!